Geoffrey Chaucer tells The Canterbury Tales for the first time in the court of Richard II. 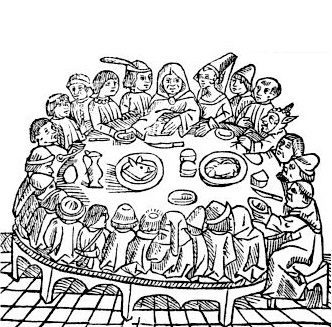 A party of 29 pilgrims assembled at the Tabard Inn in Southwark, England, preparing to travel to the shrine of Thomas à Becket in Canterbury. After supper, the host proposes that they enliven their journey by telling stories. The following morning the tellers of Geoffrey Chaucer's The Canterbury Tales begin their journey. ~ General Prologue to Chaucer's The Canterbury Tales. Hall of Famer Cap Anson born in Marshalltown, Iowa. Danish author Isak Dinesen (Out of Africa), pen name of Karen Blixen born at Rungsted, Denmark. In her later years, Blixen dressed sometimes as commedia dell'arte character Pierrot. Opening of Lowell Astronomical Observatory in Arizona. Writer and playwright, Thornton Wilder (Our Town) born in Madison, Wisconsin. In 1962 Wilder spent twenty months in the town of Douglas, Arizona where he started his novel The Eighth Day. Journalist and photographer Malcolm Browne born in New York City. He won the Pulitzer prize for Photography for a photo of a Bhuddist monk who immolated himself on a Saigon street in protest of the government. English author and screenwriter Nick Hornby (High Fidelity) born in Redhill, English. Rock star Eddie Cochran sustained severe brain injuries in a car accident near Chippenham, Wiltshire and died in a hospital in Bath, England. The Bay of Pigs invasion of Cuba begins. Ford Mustang is introduced to the car buying republichood.